The Canadian Davis Cup team is tied with Japan 1-1 following the opening day of action at the Davis Cup by BNP Paribas World Group first-round tie in Vancouver. The two No. 1 players of their team secured victories on Friday, with world No. 6 Milos Raonic defeating Tatsuma Ito 6-2, 6-1, 6-2 and world No. 4 Kei Nishikori beating Vasek Pospisil 6-4, 7-6(5), 6-3. Canada as No. 9 (6728.13 points) and Japan as No.12 (4122.50 points) on the ITF Davis Cup Nations ranking meet each other 7th times in the history of the Cup. The Country of the Rising Sun has an excessive dominance and leads 6-0 the head-to-head record. The winner of this tie will earn a spot in the quarter-finals of this year’s competition and in the World Group for 2016, while the loser will need to participate in a World Group play-off in September in order to maintain its position in the elite 16-team category. 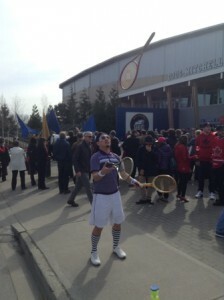 The tie is contested on an indoor hard court at the Doug Mitchell Thunderbird Sports Centre on the campus of University of British Columbia. The Canadian Davis Cup squad consisting of Frank Dancevic (Niagara Falls, Ont. ), Daniel Nestor (Toronto, Ont. 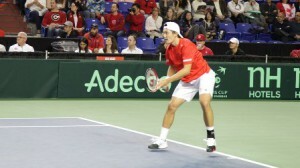 ), Vasek Pospisil (Vancouver, B.C.) and Milos Raonic (Thornhill, Ont.) along Canadian Davis Cup team captain Martin Laurendeau looks to advance into the World Group quarter-finals for the second time in its history. 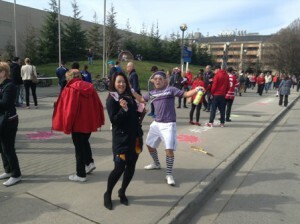 The stake is the same for the Japanese team who is led by current world No. 4, Kei Nishikori. Besides him, Japanese team captain, Minoru Ueda nominated Tatsuma Ito, Go Soeda and Yasutaka Uchiyama for Japan. 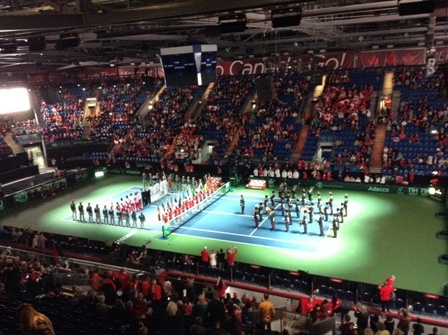 The opening ceremony was followed the first singles match between Milos Raonic and Tatsuma Ito in front of the almost sold-out crowd at Thunderbirds Sports Center which was transformed from the ice rink to host Davis Cup fourth times in the history of the venue. Raonic broke in the sixth game of the first set to take a 4-2 lead and claim firm control in his duel versus Ito. 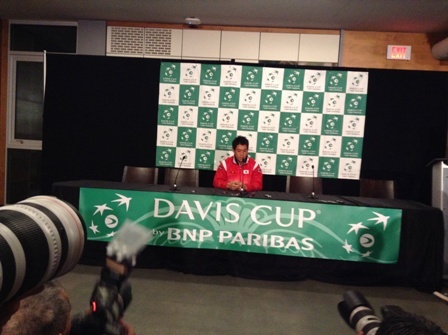 The 24-year-old hit 19 aces, won 86 per cent of his first serve points, and never faced a single break point. 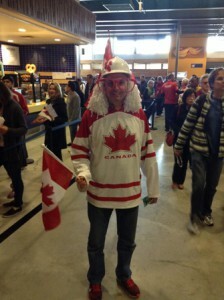 He collected the opening victory for Canada in just 88 minutes. Half an hour later, at his press conference, Raonic answered the question regarding some elements of the games where he should improve. Raonic emphasized that he is considering that his game including his entire tiebreaker stats is improving and he feels to be capable the breakthrough at the Grand Slams. He doesn’t give any value to the referenced statistics. 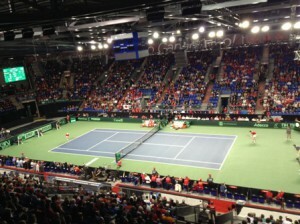 In the second match of the day, Pospisil fell to Nishikori in a closely-fought three-setter which saw Canada’s No. 2 player have his chances. The second set was Pospisil’s best opportunity to equal and come back into the match, as he earned two break points to Nishikori’s zero. 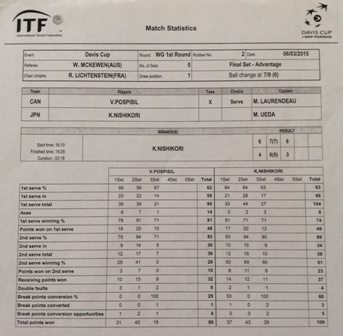 As well as in the tiebreaker, Nishikori’s top-level experience came through when he won 3 crucial points at 4-5. 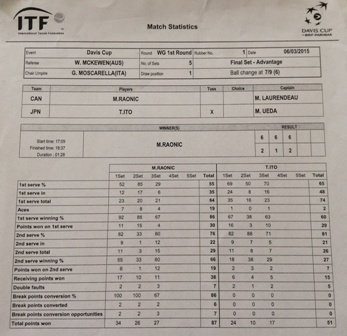 Though not much separated the two athletes statistically, Nishikori captured the triumph in two hours and 18 minutes. Similar to 2013, when Canada played in front of spirited crowds at the Doug Mitchell Thunderbird Sports Centre en route to reaching the semifinals, the first day featured a large and loud environment. Play will resume on Saturday at 1 p.m. PT with the doubles match, scheduled to feature Canadians Daniel Nestor (Toronto) and Pospisil against Go Soeda and Yasutaka Uchiyama. The team captains have until one hour before the match to change their nominations. There is a lot of speculation around that Minoru Ueda will designate Nishikori as a member of the doubles team. The tie will conclude on Sunday with the two reverse singles matches, scheduled to begin at 1 p.m. PT.